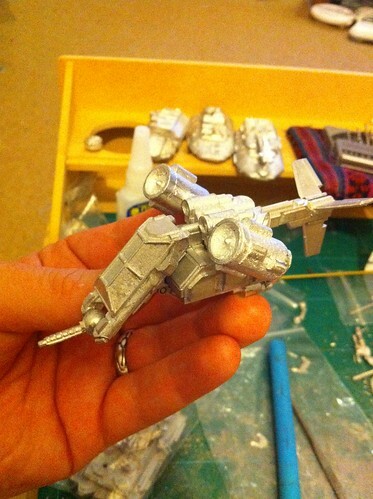 I bought two of these as troop dropships from the Colours wargames show. They are works of art in my view! Some of the best 15mm SCI-FI Miniatures money can buy. This 15 part Roach VTOL kit has a very clever design with a single core structure component that jets/props and cockpit snugly lock together on. 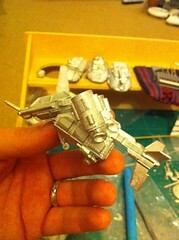 You can also base it with the door on the troop pod open and undercarriage down. I will be basing my other one with under carriage down and ready to let the troops out of the door. I spoke with Jon Tuffley, the owner of GZG, at the Colours show and he explained that all his models are hand crafted, with no computer aided design. You can really see how his years of experience in building kits like this have added to the quality. It is a shame that the photos of the model on the GZG home page are limited to only a front view. It is a considerable chunk of solid metal, so fans of weighty vehicles on the table will like the heavy duty construction. Thanks Robin, you are a star. I have browsed past this model on the GZG site many times but had no idea how good it was until your shots from Colours. Will have to add a couple of these to my next order. Any chance of a shot w/ an N.I. regular beside it for scale?